Since its purchase in 1980, following the tragic death of Luigi Pira, last in line of this historic family, Chiara Boschis di E. Pira has now grown this jewel of Barolo wine estate to 8.5ha/35,000 bts/ 50% of it, Nebbiolo. The estate is, like her, in perpetual motion and evolution. Since her brother Giorgio joined her a couple of years back, having left Borgogno, they’ve added new vineyards in Monforte d’Alba and started renting a plot in Serralunga’s Gabutti. The twin pillars of the (wine) estate are the vineyards Cannubi & Via Nuova. 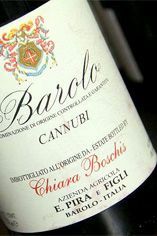 Cannubi, facing SW, is Barolo's legendary cru of which Chiara has a fair few rows. Cannubi should not be confused with the likes of Cannubi Boschis or Cannubi Muscatel. There’s been the addition of new French (Vicard) oak botte grande, and consequently marginally fewer new barriques bought, plus a new storage ‘bunker’ at their Barolo cantina. Her petite SSE-facing Via Nuova site located just up behind the winery was documented as far back as 1904, flanking the then new path to Novello; its vines are younger though, at 16 years. The modern vinification, carried out in a recently renovated cantina, is tightly controlled and constantly checked, with Chiara a keen analyst. Hulking rotofermentors still dominate the diminuitive cellar, though perhaps they're less frenetic than in the past. She’s still tending her cows in Castelmagno for their cheese, or should I say her other brother Cesare is, and in 2013 she added a new Barolo to the offer: Mosconi, a prodigious single vineyard Barolo from the village of Monforte d’Alba. Chiara's infectious energy, her can-do, will-do approach to life is reflected in her wines, which are constantly evolving she says, albeit incrementally. What doesn't alter, fortunately, is her staunch belief that the vineyards are sacred; a virtue which shines through in the deliciously seductive, compelling wines. 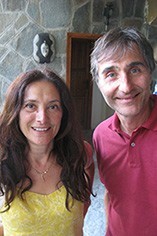 A modern producer of Barolo who’s on the right tracks. Darker cherry and brambly in character, with plum ice-cream, the 2011 Cannubi has great power of fruit on the palate. It shares the E.Pira trait of being cool, with a certain hint of Italian summer herbs, full-bodied and tannic on the finish. E.Pira was one of Barolo’s most historical producers until the Boschis family bought it in 1980, transforming it overnight into one of its most modern. Chiara Boschis is at the helm, producing fruit-forward wines that give you more of everything: more extract, colour, acidity, alcohol and oak. She mollycoddles her organic vineyards as if they’re her children. Recently joined by her brother, Giorgio, the estate has now grown to 8.5 hectares. Ripeness and refinement define this Cannubi and its complexity is already evident – sour black cherry and ripe plum are interwoven with tar and more savoury, herbal notes. There is no denying the concentration and weight of phenolic matter across the palate: this is long and powerful. Bright ruby in colour, the texture and intensity of the Via Nuova is enhanced by a fine tannic structure and cool acidity. Layers of red stone-fruit and dried flowers absorb the influence of the French oak, which brings added complexity and spice to the wine. The fruit for this cuvée is predominantly from the clones of Michet and Lampia. More intense and more definite, the new French oak (70% botti grande, 30% barriques) shines through giving it a predominantly coffee bean character. Crunchy cool from a ‘first off the blocks’ early harvest (30th September), Chiara’s Cannubi is shy and reticent in youth, refined, sylph-like but with a lush velvety core. Needs time. Following the extraordinary 2004 vintage, wines now available are the 2005, soon to be 2006, which are both good and need to be kept (8 to 10 years is a good drinking window guide, according to Boschis). Try then the sublime E Pira Barolo Cannubi 2005. It's expensive, yes, but then Barolo is like Burgundy: you need to spend money or don't bother. The magic's there or it's not. Chiara captures the expression of this sun-drenched sandy-marne site perfectly: molten tannins amid a deep sea of dark plum, choc and even blueberry notes. It’s so finely woven, so pulpy and tasty, yet with an undercarriage to take it forward. Modern yes, rotos and barrique, but beautifully pure too; in fact you may come across some harmless anthocynanins/grape sediment as the wines are not fined or filtered. 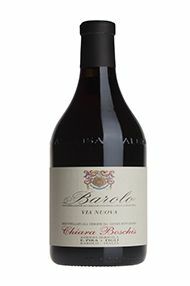 This is Chiara’s benchmark Barolo: a classically structured wine underpinned by the (Barolo) village’s cool blue marne subsoils. The vineyard’s located alongside ‘Via Nuova’, the now old route from Barolo to Novello; just behind the Pira winery. The 2006 vintage has given this wine a dark brooding character that contrasts so sharply with the decadent weave of her Cannubi; a wine that’s all sun & sand. Via Nuova is the cooler of the site, definitely, & will probably round faster too. Yet Chiara’s (gently) extracted the essence of both & framed them perfectly. Lusher and fuller than the mineral rich 2006, one can sense the warmth and dryness of the 2007 vintage in this wine. 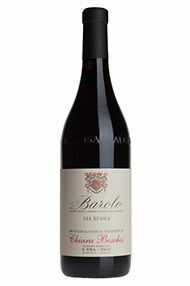 Despite these dry conditions Via Nuova remains a classically structured Barolo with compact dark notes of tea, spice and leather. Chiara’s Cannubi is distinctly bright and pale red in colour, setting it apart from the blueberry purple of Mosconi. The colour is a tenuous link to the great Baroli of Serralunga d’Alba, where sand also plays an important role. The nose too is equally lifted, notably finer than Mosconi, with a pert cherry red kirsch character that elegantly continues on into the strawberry, salato palate in one fluid movement. There’s a freshness that supports the fact that Chiara is one of the first to harvest. Promising. Drinking 2017 – 2027.